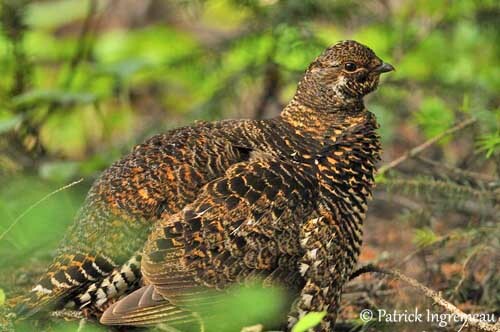 The Spruce Grouse is a typical forest species, one of the most arboreal grouses, often seen moving about and perching in trees. The adult male has dark plumage, grey above and black below. On the upperparts, the grey feathers are edged blackish from nape to uppertail-coverts, including the wings which are slightly browner and finely streaked white. The short tail is black with chestnut tip. On the underparts, chin, throat and breast are black bordered by white narrow stripe. We can see conspicuous white spots along the sides, contrasting with the black background. Undertail feathers are black with large white tips exposed during the displays. On the head, forehead, crown, ear-coverts and nape are grey, sometimes finely streaked white. Chin, throat and cheeks are black. We can see a white irregular patch on the rear of the cheek. The bill is blackish with black upper base bordered white. The eyes are chestnut-brown with red comb above and white narrow crescent below. The combs become much brighter and larger during the displays. The legs are feathered greyish-brown. Feet are grey. The female is paler and browner with cryptic pattern. Throat and breast are mostly tawny to whitish. Body sides are ochraceous. The underparts are heavily barred brown and white. She has the red combs too, but smaller than in male. Females have two morphs, grey and red. The juvenile resembles adult female but it has buffy-white head with chestnut crown. Wing-coverts and flight feathers show pale white or buffy markings at tip. The underparts are paler than in female and more finely spotted and streaked. Legs and feet are pale pinkish. We can find six subspecies sharing the wide range from Alaska to Nova Scotia. These subspecies are osgoodi, atratus, canadensis, canace, torridus and franklinii. They differ in extent of white on the underparts and on tail pattern. The Franklin’s Grouse (F.c. franklinii) has white spots on the uppertail-coverts and has all-dark rectrices. This race is found in N Rockies and Cascades. 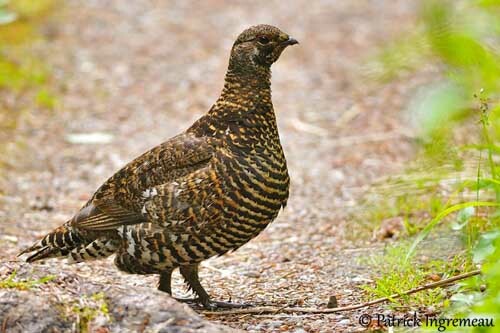 The Spruce Grouse male produces various sounds with wings and tail while displaying. Rapid wingbeats, both on the ground and in the air, produce some drums. Other sounds called “whooshing noise” are produced by spreading quickly the tail feathers. Soma males may give series of low-pitched hoots and also “krrrk-krrk-krrk-krrrk” sounds. The Franklin’s Grouse produces a clapping sound by beating the wings together after the territory flight displays. Females give territorial high-pitched calls and low clucking notes. 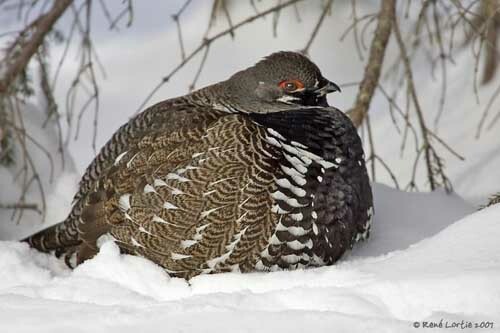 The Spruce Grouse is usually found in boreal open coniferous forests with dense undergrowth, and pines of genus Pinus, spruces of genus Picea and firs of genus Apies and others. During summer, it frequents areas with low shrubs and especially blueberries (Vaccinium). In fall, it can be seen along the roadsides or perched in trees. 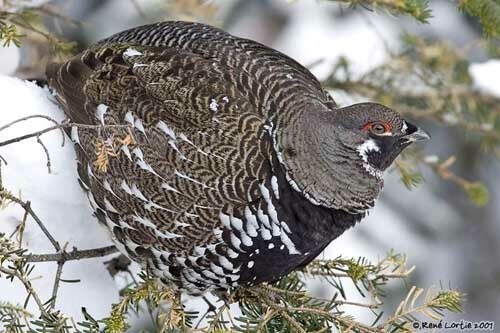 The Spruce Grouse is found throughout Canada. Six races occur from Alaska through Canada to Nova Scotia. This species is also present in several northern regions of the United States. 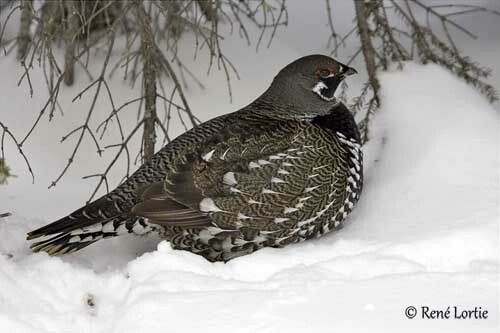 The Spruce Grouse in winter feeds mainly on pine and spruce needles. During summer and autumn, the adults feed on shoots, leaves, flowers and berries (blueberry and crowberry) and other vegetation taken from the ground. But the chicks feed primarily on arthropods during the first week of their life, and then, they take berries, needles and fungi in fall. 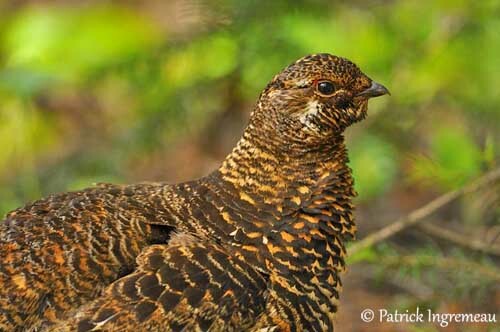 The Spruce Grouse forages all the day, but mainly in early morning and late afternoon. The male is usually silent and solitary, and it is rare to see several adults together. The female remains with her young for several weeks after breeding. 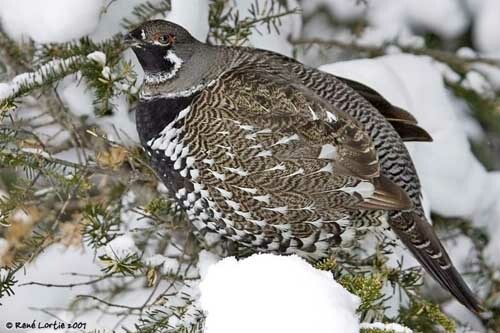 At night, the grouse roosts in spruce tree, often near the trunk, or in “snow-roost” beneath the snow surface. During the breeding season, the male performs noisy displays, producing numerous non-vocal sounds. It struts in clearings, opening and closing its tail abruptly, producing “swishing” sounds. It may sometimes beat the ground quickly with the feet, involving resonance inside its body. Mechanical sounds are produced too, such as “clapping” and “drumming” with the wings, “stamping” with the feet, and “whooshing” or “swishing” with the tail, while the white patches are exposed. 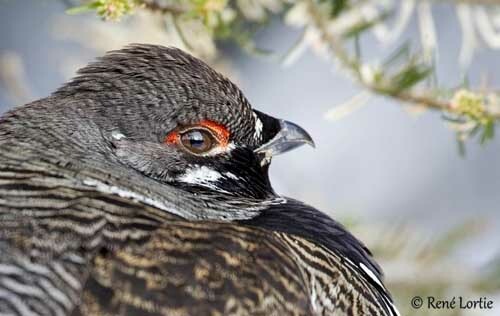 The Franklin’s Grouse performs active “wing-clapping”. The male is clearly polygamous. It has a very large territory within which it calls and displays to attract females. The red eye-combs become larger and brighter while the bird is strutting, jumping, flying from perches to the ground and sometimes rising almost vertically with noisy, fast wingbeats. Such displays can be used both in courtship and in defence. Aggressive encounters between males can be ritualized, but some of them are real and violent. During the territorial flight, the male flutters upwards on shallow wing strokes. We can hear sometimes low hoots given by males. They are promiscuous and dispersed. The females visit their territories for mating. 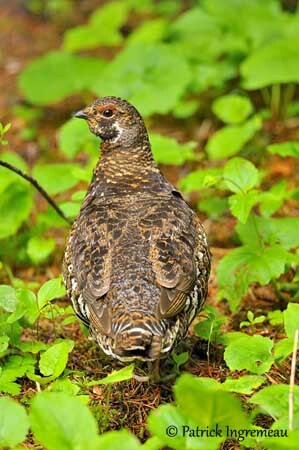 The Spruce Grouse is mainly sedentary in its range. Short movements are reported at dawn and dusk in some regions, but only over some kilometres. The Spruce Grouse performs rapid wingbeats during the flight displays. The wings are short and rounded, and allow the bird to reach great speed very quickly, that is a high energy investment. The take-off is noisy and strong, followed by series of fast wingbeats alternating with glides on down-curved wings. Flights are usually short. 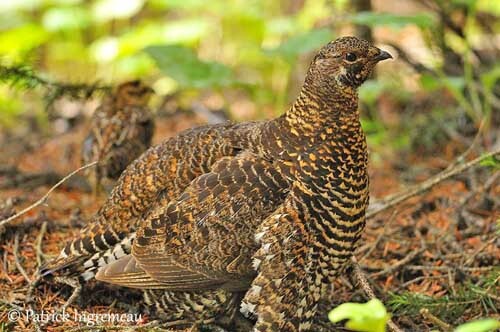 However, the Spruce Grouse is reluctant to take flight in its forested habitats, and only ascends or descends from trees for feeding, resting or displaying. The breeding season occurs between early May and early June, with the laying in June. All the nesting duties are performed by the female alone. She selects a nest-site at base of pine or spruce tree or beneath a log. The nest is a depression on the ground, lined with dry needles or leaves, and some feathers. It is usually concealed in vegetation, providing a kind of roof. She lays 5-6 tawny olive or buff eggs with brown markings. She incubates alone during 24 days. The precocial chicks have the typical chestnut crown of Tetraonidae species, and cryptic colours. They leave the nest a few hours after hatching. In order to escape predators, they are able to flutter up from the ground at one week old. The female broods them at night and sometimes by day too during the first 3-5 weeks. The young birds leave the family group about 70-100 days after hatching. This species produces a single brood per year. The male sometimes joins the family group in late August and it can be seen with a large group including several females and their broods. They separate by October to spend the winter. 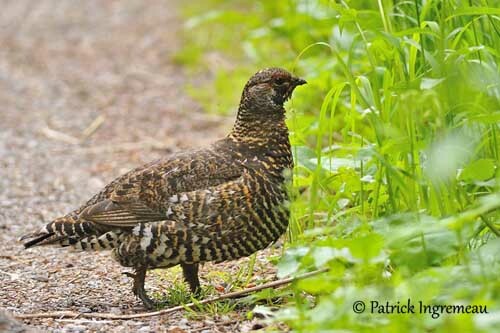 The Spruce Grouse feeds on shoots, leaves, flowers and berries during summer and autumn. The chicks feed mainly on arthropods during the first week. During winter, the adult’s main food includes pine and spruce needles. They forage throughout the day by walking. 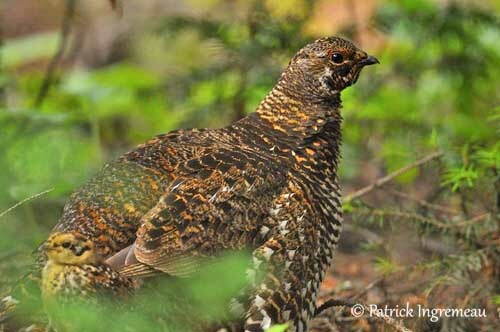 The Spruce Grouse has very wide range and large populations. The species is widespread and relatively common in most parts of the range. 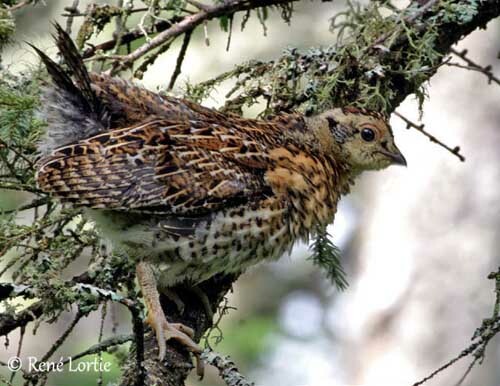 Usual threats include the cutting of original conifer woodland, but fortunately, the Spruce Grouse has adapted to secondary growths. These grouses are famous gamebirds and are commonly hunted, but their populations appear not seriously affected and are fairly stable. 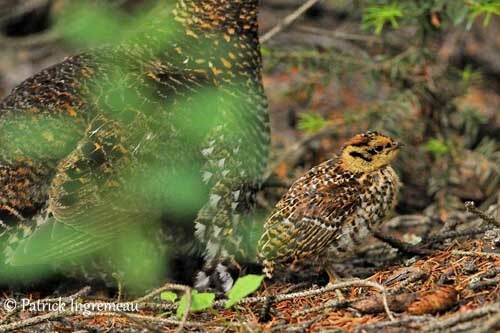 The Spruce Grouse is not currently threatened.